Park Forest, IL–(ENEWSPF)– It may be summer but Park Forest’s elected officials, management and staff continues work on current projects, events, and future planning. Thanks to those that have commented on how informative you find these weekly reports. July 29, from 5 PM to 7 PM. Please note that July 29 is the last date for parents/guardians to return completed registration packets for current students. Thursday, August 13 from 9 AM to 2 PM and 5 PM to 8 PM. The first day of school is August 20. For questions about registration, please call 708-668-9408. This week, the Economic Development and Planning Departments co-hosted the Business After Hours event with the Matteson Area Chamber of Commerce. Attendees had many good things to say about the networking opportunities, great food, and opportunity to learn more about our local businesses. Congratulations are extended to Village Staff on a job well done. Village Manager Tom Mick, Finance Director Mary Dankowski, Police Chief Tom Fleming and Fire Chief Bob Wilcox attended a meeting of the SouthCom Board of Directors last week. The session included a status update of the consortium’s planned transition into a new computer-aided dispatching system and record-keeping interface. The Board also received an update on some personnel matters, reviewed a lobbying agreement for 2009/2010 and revised SouthCom By-Laws as amended in the Fall of 2008. The Village’s audit team from Baker Tilly Virchow Krause finished interim work last week. The audit field work will begin September 21. When the temperatures soar and you need a place to cool off, remember that Village Hall (350 Victory Drive) and the Park Forest Police Department (200 Lakewood Boulevard) are the community’s designated cooling centers. Village Hall is open during routine business hours while the Police Department is open 24 hours. Also, please remember to periodically check in on family, friends, neighbors, and the elderly to ensure that they are adapting well to the heat. This week, 188 inspections were performed. These included new construction, re-occupancy, inspector initiated and referral/complaint. In Civil Court action on property maintenance code enforcement matters, information gathering continues for the Thorncreek cases. The department responded to 54 requests for service during the past week. This included 41 emergency medical-based requests and 13 fire related requests. Included in these responses were 12 double calls (2 calls occurring at the same time) and 1 triple call. The fire department also received mutual aid and automatic aid one time each from Richton Park, to help support our operations. 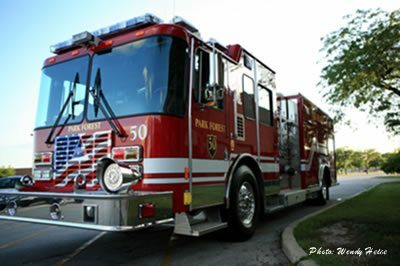 The Park Forest Fire Department provided mutual aid to Dolton as part of a Hazardous Materials Box Alarm response on I-94 at the steel bridge. Members of the career division have been working on long driveway type scenarios. This type of location is one where the standard attack lines on the fire engine will likely not reach the occupancy without taking some special steps. These training sessions have involved identifying these occupancies, working through potential procedures and practicing a generic scenario for this type of incident. These incidents are rare in Park Forest, but training keeps them in the minds of our personnel. Members of the Paid-on-Call (POC) division, along with some members of “C” shift trained in two emergency medical services areas this week. First a representative from Invisible Fence Company was on hand to present the department with a pet resuscitation mask kit and provided training on its use. The representative brought along a willing assistant, Lotus, a 16-month old border collie, who with some encouragement, helped to demonstrate the product. This donation is part of a nationwide program by Invisible Fence to assist emergency care and rescue personnel with pet emergencies. Next, the POC division received training and practiced with a set of vacuum splints for injury immobilization. These splints use a series of beads in an air-tight case, that when a vacuum pump is applied, conform to injured areas. This then provides support for the injury without applying pressure to the area as a result. This demonstration was part of an evaluation of this equipment to see if it would be useful to Park Forest emergency responders. Deputy Chief Bruce Ziegle spent last week acting as a peer reviewer for the Assistant to Firefighters Grant program. These programs are the only ones of their kind in the Federal system to be reviewed and evaluated by members of a peer group. More than 300 reviewers participated in one of the last two weeks to provide the required three evaluations to each grant that was paneled. This process is key to the distribution of millions of dollars to fire departments nationwide in response to request submitted in one or more of the three grant categories. An added benefit to this process is the ability of the Fire Department to enhance its grant requests through experience gained in these evaluations. Officer Paul Shulman was recognized by the Alliance Against Intoxicated Motorists for his enforcement of the DUI traffic laws. Officer Shulman made the most DUI arrests in Park Forest during 2008. The Ultimate PAAC Challenge will be held next week for all PAAC participants at Rich East High School. They will compete in a series of track and field events at the school. Congratulations to Bob and Amanda Bruns on the birth of their daughter, Charlotte on July 20. She weighed in at 8 pounds even and 20” long. Mother and baby are doing fine. Condolences are extended to Chuck and Loretta Alexander on the passing of his sister-in-law, Renee Fulwood on July 21. Ken Eyer, Roderick Ysaguirre, and Tom Mick interviewed four candidates for the Engineering Technician position. They are reviewing their interview notes to determine the most qualified candidate or whether to re-advertise for more prospective candidates. Watermain breaks were repaired at 174 Monee Road and across from 444 Shabbona Drive. Parkway tree branches were trimmed and then chipped on Chestnut in response to wind damage by a recent storm. Luckily the damage was mainly limited to this small area. Storm sewers were repaired at 4 Monee Court and 347 Neola Street. Sanitary sewers were cleaned and street lights were re-lamped Village-wide. Tress were trimmed at Commuter Lot #1. Staff are working with Hach Company on a beta test for their new turbidity meter. This meter determines if the water is cloudy.